The territory labels look good. Dotted lines for sea routes work too. i honestly dont understand though, most maps are into gameplay by 5-6 pages then graphics by about 15 pages, this is at 14 pages and 10 versions with no current suggestions and yet it is still here. is it because this is my first map? kengyin wrote: i honestly dont understand though, most maps are into gameplay by 5-6 pages then graphics by about 15 pages, this is at 14 pages and 10 versions with no current suggestions and yet it is still here. is it because this is my first map? wait, where does it say that? This map is looking really good. A few of the borders seem pixelated. Maybe you can correct that? which ones, the HCMT perhaps? The HCMT has pixelation, but I think the south central coast thing is just the texture interacting with the borders. Grats kengyin! You're a shining example of the value of perseverance. anyone have any problems with the gameplay? First thing I have a problem with is the mission brief... you talk about the Korean War like it was the day before the Vietnam War. I'd suggest maybe a narrative or something of the situation in Vietnam c. 1972. Gameplay wise... I rather like it. I think it does some good justice to the situation in Vietnam at the time. The only concerns I would have though, would be that the regional bonuses might be too high. But that's just a glance. If I were you, I'd try to get Tacktix and IanCanton to take a look. They've got a good eye for making things mesh. in terms of theme that is definitely where i want to head, however the images i looked at didn't really fit (hey its google), and i don't know how to make them kind of fit in with the, i don't know how to describe it, the feel of the map maybe, the map just looks you know not top quality if you know what i mean and putting photos on would look too real and really make the amateurishness of the actual map stand out, while if i drew it on then that would look even more amateurish. the only reason i have improved so much from my previous drafts is actually due to your tutorials. yeah, thats the kind of guy i am, a very systematic mathsy kind of person, i can learn very quickly from others and when it comes to art i can learn quickly when given instructions but not by doing it myself. i'm definitely not giving up thats for sure, just really not sure how execute the legend properly. don't you get that annoying feeling when you know what you need to do and where you are going but you can't actually do it? how long have you been making maps? kengyin wrote: don't you get that annoying feeling when you know what you need to do and where you are going but you can't actually do it? 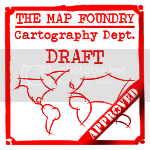 Situations like those are the ones that really put your resolve as a mapmaker/graphic artist to the test. It's easy to create graphics when all you have to do is things you already know how to do. The tough part comes when you know what you have to do but don't know how to do it. The upside however is, that every time you push yourself to do something you have no previous experience with, you learn a ton of new things and develop as an artist. As general advice I'd say, look into drawing and graphics making for more than just mapmaking. There's lots of good graphics tutorials online if you search for them. Read them, practice creating images that have nothing to do with maps. You'll get experience of things that you can later use in maps. You learn by doing. As specific advice for this... well, pretty much the same advice. I can't specifically tell you what to do, that's something you have to learn to find out. My tutorials gave you some basic tools and tricks you can use... now you need to find your own tricks. In way of analogy: you could think of my tutorials like grade school, where the basics are taught to you by the teacher, things are laid in front of you nice and clear... now, it's time to graduate, and enroll into high school/college where you have to do more independet studying, find your own "classes" and learning materials... basically, you have to teach yourself. The only pixellation I can tell is the triangular mountain range bits. I sort of like the mission briefing. It reminds me of one of those old Nintendo Entertainment System games . I think the vibe of the map is more leaning towards fast and fun which seems totally ok to me. Some of the current historical maps are a bit heavy anyways. the gameplay has obviously been carefully crafted. i'm not finding a lot wrong with it! uss enterprise and all 3 decaying hcmt regions ought to start neutral (i suggest 2 neutrals on each). this leaves 52 non-nuetral starting regions, which is a good number. no-one will capture hanoi and saigon if they have to go thru 5 neutrals for a +1 bonus. +2 auto-deploy is more realistic; look at castle lands games for an idea of the proportion of games where the capitals will be taken (the castle starts with 4 neutrals and yields +2). u must make the hcmt clearer. 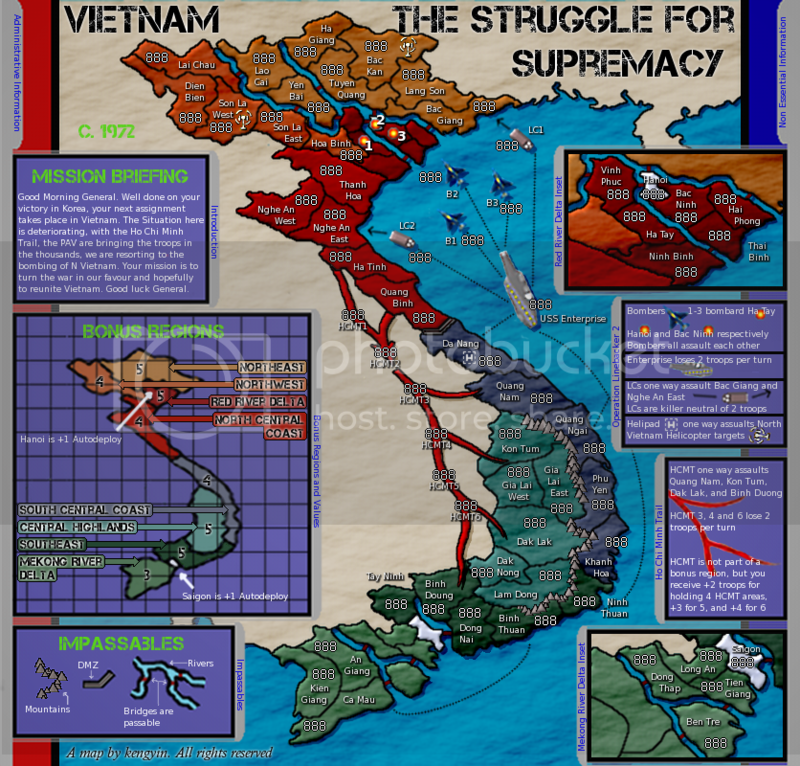 i'm not sure whether the hcmt regions can attack backward or whether they can attack regions in north vietnam. a blast symbol beside each decaying hcmt region will be helpful as a visual guide to its status. i think maybe i could have hanoi and saigon, could just have 2 neutrals and +1 autodeploy. because in this gameplay really apart from that autodeploy, those 2 cities aren't significant to the overall strategy, so people shouldn't really pour that much troops into that, i thought it was more just kind of a mini base of sorts where you can send some reinforcements via the autodeploy to the rest of your territories, but yeah apart from that it doesnt have much strategic value i dont think. kengyin wrote: i think maybe i could have hanoi and saigon, could just have 2 neutrals and +1 autodeploy. because in this gameplay really apart from that autodeploy, those 2 cities aren't significant to the overall strategy, so people shouldn't really pour that much troops into that, i thought it was more just kind of a mini base of sorts where you can send some reinforcements via the autodeploy to the rest of your territories, but yeah apart from that it doesnt have much strategic value i dont think. i say 3 neutrals and +1 autodeploy. i'm looking at Nordic Countries as an example. 2 neutrals might be too easy to get. In Nordic, the capitals are needed for their respective bonus areas, which is not the case here... I think 2 neutrals would be enough for the capitals. Alternatively, you could have them give +2 autodeploy and make them neutral 3:s.